Fidel Castro to Cuba is like Mandela to South Africa – you just can’t get into any meaningful conversation about Cuba without discussing Fidel Castro and his impact on shaping Cuba, it’s culture, values and politics. To understand Cuba better, let’s go back and get to know this iconic figure a little better. 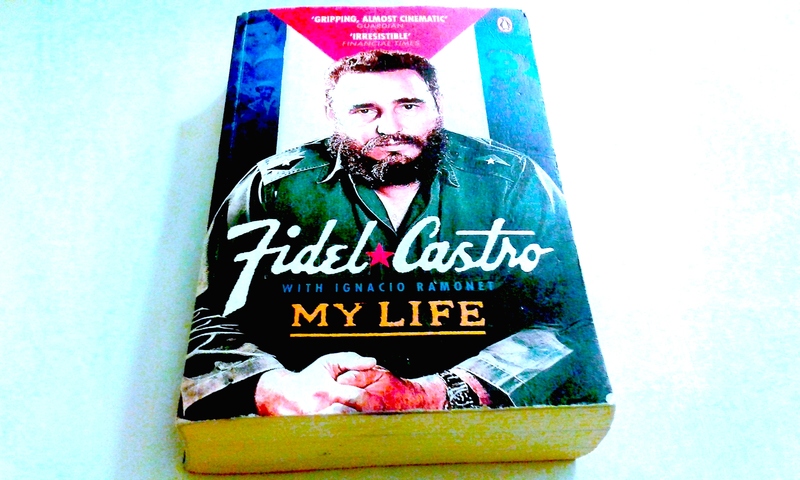 Author Ignacio Ramonet documents his firsthand, lengthy interview with Castro in this book, Fidel Castro with Ignacio Ramonet, My Life. Broken down question by question – it’s easy to read and digest bite sized pieces from the volume of information he gathered. Just put the cuban cigars, classic cars, salsa moves and Varadero beaches to one side for a moment. Castro was named after a millionaire friend of his father, he was a law graduate, a highly respected and influential political speaker an anti-capitalist and strongly influenced by marxism (taking me back to memories of A Level Sociology). Castro took action to overthrow the harsh authoritarian dictatorship of Machado and the take-over of Batista. Che Guevara was also a great companion of Castro, admired by Castro for his marxist revolutionary stance – together they became a force to be reckoned with in Cuba. Never mind making youtube videos and computer games – imagine having to make your own shoes as a young child, growing up away from your parents, suffering from hunger and lack of general day to day stimulation. Well this was Fidel’s experience whilst living in the home of a teacher. Castro reflects on when the sugar industry was booming in Cuba, tens of thousands of Haitians flocked to Cuba to help with the “cultivation and harvesting” of the sugar cane – Haitians became slaves and were treated like animals whilst their population in Cuba was growing. When this treatment of Haitians was challenged, and revolution was brewing around 1933, the law was changed to give preference to Cuban citizens for jobs in Cuba. Subsequently, many Haitians were shipped back to Haiti with no remorse. Castro witnessed this. In his school days, Castro was a sportsman and a mountain climber; he describes himself as a self-taught man as he never really paid much attention to his formal classes and his rebellious nature began to manifest from a very early age, along with a strong anti-capitalist stance. Imagine being an outspoken university student who strongly opposes a potential election candidate to the extent that the mafia turn their eye to you and start an intimidation campaign against you that prevents you from setting foot in the university you are enrolled with. At this point you have found yourself with a personal (rather than merely ideological) conflict with the powers that be, and you are individually targeted and threatened by it. Then your friend goes out and buys you a gun. Yep!! Here your very first literal battle with the government and state begins. That’s what happened to Castro. By the age of 21 Fidel Castro was the chairman of the Puerto Rican Independence Committee and Dominican Democracy Committee. Seeing injustice, poverty, unemployment etc around him in his own community, Castro cemented the conviction that the current ‘system’ wasn’t working – a capitalist system. Castro emerges as a man of great conviction, an ambassador for the fight against all kinds of injustice and discrimination in society. Fidel speaks openly about attempts on his life and alleged biological warfare against Cuba from the USA/CIA; “from the first moment the American administration has been working to create an unfavourable image of the cuban revolution. They have carried out huge attempts to isolate Cuba……they broke off diplomatic relations in 1960 and took measures to impose an economic blockade” pg 255. The interviewer and author of this book, Ignacio Ramonet, explores various wars and combat situations with Castro in great depth, across several chapters. Interesting: Che Guevara taught many African nations how to become more effective in warfare including the Congo and Tanzania. Castro goes on to talk about Cuba’s influence in Africa, and tells us that Nelson Mandela is probably one of the world leaders he admired the most; he points out that people are insufficiently knowledgable about Europe’s “imperial and neocolonial looting and pillaging of Africa, with the full support of the United States and NATO” pg 308. Castro: “Who has ever shown more solidity with Africa than Cuba has? What is the only country that has spilled it’s blood fighting against fascism and the racism of apartheid, helping to eliminate that hate-filled system?” pg 572. Castro describes how Cuba’s military fought in/with/for Angola during some very bloody attacks from racist South African forces (which he points out – collaborated with the USA – the USA supplied South Africa with nuclear bombs to fight against Angola). Many wounded Angolans (including children) were brought back to Cuba to recover and were then also educated in Cuba. Cuba also fought to help secure the independence of Nambia. Similarly, many cuban doctors went to Algeria to help them when they were under attack from the french army. Castro highlighted (at the time of the interview) that globally, Cuba educates the greatest number of doctors in the world, and that Cuba is in a position to educate ten times more doctors than the USA. This puts a whole new light on the saying ‘size isn’t everything’! Cuba also fought side by side with Algeria when Morocco threatened Algeria’s wealth and resources – which Algeria had already struggled to hold onto – against colonial might. Cuba sent additional reinforcements to support this defence. Castro tells us of how Cuba offered support to the USA after hurricane Katrina. Cuba offered to send nearly 2000 doctors, but the USA refused Cuba’s offer. Many lives were lost during the aftermath of hurricane Kartina, as people tried to fend for themselves. At the time of the interview, Castro went on to highlight that Cuba has around 300,000 doctors working around the world and at least 40,000 on it’s own soil, and that Cuba also boasts one of the lowest rates of AIDS in the world. We hear how Cuba also sent doctors to Pakistan following an earthquake in Kashmir, not to mention Guatemala following hurricane Stan. Cuba also spilled blood when supporting both Cape Verde and Guinea in fighting for independence from Portuguese colonies. Similar solidarity has been shown to Vietnam during the war and to Syria against unfair occupancy. You will notice throughout Castro’s memoirs, that he illustrates example after example of injustice, unfairness and reasons to defend and protect a nation or people under all sorts of persecution or bullying – which he vehemently opposed. Cuba has also sent teachers out across the world. Cuba has made many good friends across the globe, but the USA clearly isn’t one of them. Castro describes Cuba’s feeling toward the USA as being like a human with a wild animal (lion etc) – you should never turn your back on your enemy otherwise it will attack you. You have to “face your enemy down” pg 446. Why (Castro more or less asks) did the USA impose policies on Iran to prevent them from producing nuclear powered fuel when countries like France, Japan, South Korea and Canada were doing exactly the same thing without being bombarded with the same restrictive policy? Castro reflects on The Adjustment Act (1965) when every cuban that wanted to leave and go to America was to be given a ticket………I wonder what the take up would be like if the UK government offered tickets like this to it’s citizens!!! Some cubans crave the apparent perks of a consumer and capitalist driven society, which is offered in abundance in the US. Castro “Capitalism is the creator of all sorts of germs” pg 359. As a non smoker, I had to smile at Castro’s comment about a box of cigars (given their prominence in Cuba), he says “…..the best thing you can do is give this box to your enemy” pg 400. “If Latin America were devoured by the empire (USA), if we should be swallowed up by it, then like that whale that swallowed the prophet Jonah and couldn’t digest him, it would have to spit us out one day; we would be born again in our hemisphere. But I don’t think we’d be easy to swallow…..” pg 536. Castro proudly reflects on the advances made in Cuban society as a result of the revolution – including improved health care, drugs, gambling and literacy rates, homelessness and the dozens of countries in the ‘third world’ that Cuba have provided aid to. Castro also shares his views on the media – namely that it is an ideological state apparatus, churning out untruths and brainwashing the masses, causing them to lose their ability to think for themselves. Castro points out that he has never sought media attention or publicity – never wasted time or money on these things. ‘The cult of personality and idol worship’ is something Castro made clear to his people that he did not condone or support. (As I read this I think of Instagram, and social media in general today – which is pretty much all about the very thing Castro despised. Obsession with followers and views, competition based on personality/person popularity, at it’s worst, is essentially a branch of idol worship). Castro maintains that the lies and negative propaganda spread about him personally and Cuba generally, all come from a place of hate, contrary to his values and motivations to help and protect nations and people. “I’m also a witness to the fact that throughout the years, influence, power, rather than gradually making me conceited , vain and all that – every day, I think I’m less conceited, less pretentious, less self satisfied. It’s a struggle against your instincts. I believe that it’s education, or sincere and tenacious self education, that turns a small animal into a man.” pg 575. Anyone with an interest in this inspirational Cuban leader will surely find elements of this book interesting, I’d definitely recommend it. I’d also recommend reading this and around Cuba’s history a little before visiting Cuba for the first time – it might just make the experience more enriched and meaningful than the usual cigar and car poses. Pingback: Before I went to Cuba…. Hmmm … seems to me that you’ve fallen for the pervasive propaganda that has dominated Cuba since the revolution. Fidel was a dictator and a con man who lived the life of luxury while his people starved. Che was nothing more than a cowardly thug who set up Castro’s firing squads. Years of propaganda have made these two into legends. There is a lot of other reading that presents an entirely different historical account of the past 60 years. Interesting….you are right, I’ve only really heard and read fairly positive things about Fidel Castro…though I understand that not all agree with communism. I’m surprised at the term ‘con man’ though! It’s definitely a good idea to read around and reflect on different perspectives. Thanks for your comment. ..it’s got me curious! !